Looking for attractive recycling bins and trash cans that compliment your décor? From small recycling bins for office areas, to durable outdoor recycling containers, our products can outfit any area throughout your facility. 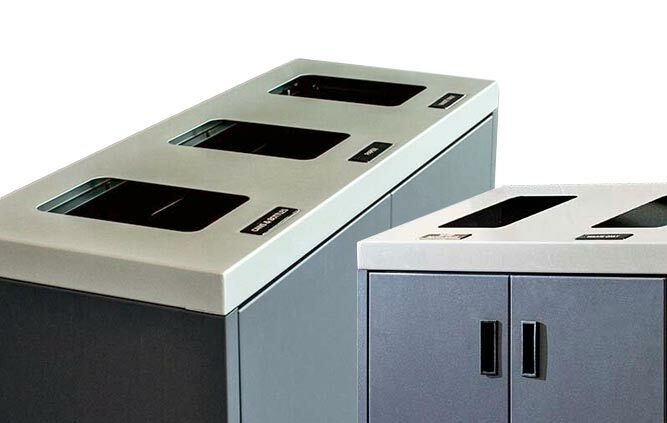 Our stainless steel commercial recycling bins and waste bins will help keep your office clean & litter-free, and provide a hygienic receptacle that is both stylish and versatile. Alternatively, choose from our wide selection of sleek wood laminate finishes to create a unique garbage & recycling station that compliments or matches any existing interior design. At Waste Wise Products, we guarantee our service & expertise make us the best solution for business furnishings! We offer the widest array of customizable recycling receptacles, garbage cans & furnishings for Architects, Designers & Facility Management. Outfit your entire facility with our competitively priced recycling & waste receptacles, benches and picnic tables for offices, commercial, industrial, schools, institutions & sports arenas. Promote your company's green thumb by branding your recycling bins and waste receptacles through our multitude of finishes & corporate branding customizations. “ I had a great experience working with and ordering from Waste Wise. 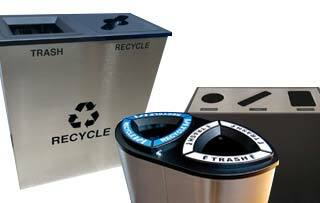 They had a wide variety of waste receptacle options, great pricing and on time delivery. or Purchase Orders (with credit approval).